By the way, regardless of whom you back, like, dislike or disagree with, be very certain that any of the headlines and posts that I see flying around stating that Trump attempted to intimidate or menace hillary by following around or standing over her are not only flat-out inaccurate, but a clear sign that whoever is telling you this (and actually believes it) did not watch the debate. But most people didn’t and these type of headlines carry the election. Anyone who watched it saw Hillary (in an unfortunately brilliantly choreographed strategy) time and time again get up and walk over to Trump’s side (Trump stayed on his side the whole time). She would walk right passed him ignoring him and then face the public while giving him her back. She knew this would create the desired effect, the cameras facing her would catch him (obviously bigger and taller) awkwardly behind her. What they don’t show is that without exception, Trump is standing on his side, next to his chair/stool. 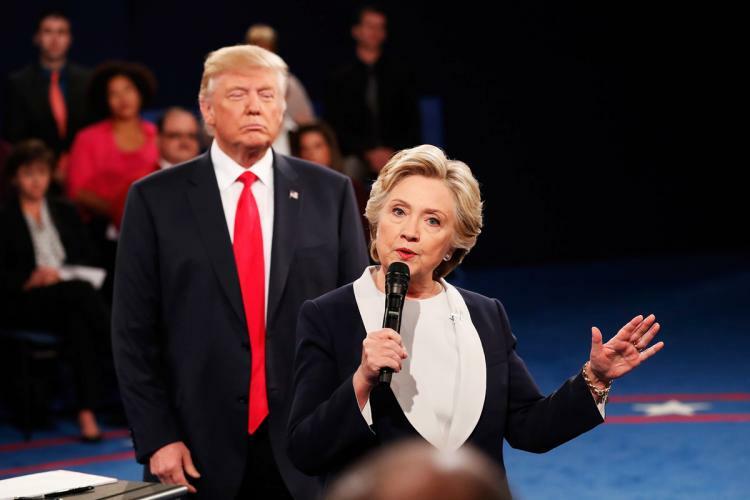 All time low for leftist media, accusing Donald Trump of “stalking” Hillary during the second 2016 debate. Most of the “bad” images and angles are from the very first time hillary did this. Trump was visibly uncomfortable being so close to hillary, but felt he should not “run away” from his own side of the podium and his own chair and table. From the second time onwards, he had half-decent solution, he simply would face a different direction and not look at hillary. And so though he was still standing “right behind” her, the images don’t look menacing because he is facing a different direction. But the camera shots from hillary’s first attempt, which caught Trump unaware, are all the media needed to spread these ridiculous lies. The truth is firstly that if this is all they have to say about this debate, it is a clear sign of Trump’s superior performance. Donald Trump, not wanting to “run away” from his own podium, nor be accused of intimidating Hillary, decides to face away from her. But more importantly, as this was obviously a shameless attempt to tie in the tapes and portray trump as a predator of women, it speaks of in what contempt hillary holds the american public and women specifically. Obviously she was not scared or intimidated by trump, especially as she continuously walked over to his side and occupied his space to create this scenario the media swallowed whole, but she thinks that american women are so weak, gullible and afraid that they will in fact believe that trump was menacing and bullying her, when in fact she set him up and is playing on their emotions. Of course trump was a political menace, and each candidate intensely attacked the other, but neither was a physical menace to the other, and it is incredibly low to invent this kind of garbage. It was a smart stratagem by hillary, but only because unfortunately the media is an all too-willing ally, and too many people too willing to believe their every word. 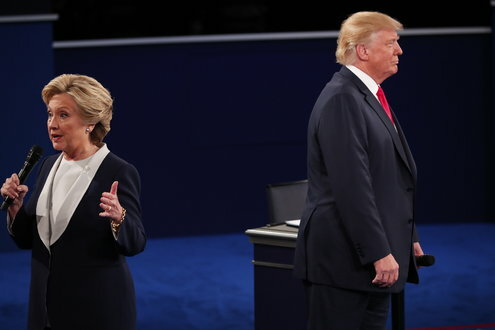 I would love to hear from anyone who actually watched the entire debate, to sincerely say that Trump came even close to physically stalking, menacing, or in any other way intimidating hillary. Had their walking patterns and positions throughout the debate been reversed, trump would have most definitely looked like he was bullying hillary (by constantly invading her space), but because the contrary is true, no one will say that about her (nor should they… obviously that would be absurd), but instead they are saying it about him. And she knew it would work… “since he won’t come up to me, but rather respect my space, I will simply come up to him, and make myself ‘encroached upon’ by him… the effect, is the same especially in a still shot by friendly journalists”. She figured she was giving trump two options, either run off every time she approached, or hold his ground and be seen as a bully. To an uncritical audience, she was right.